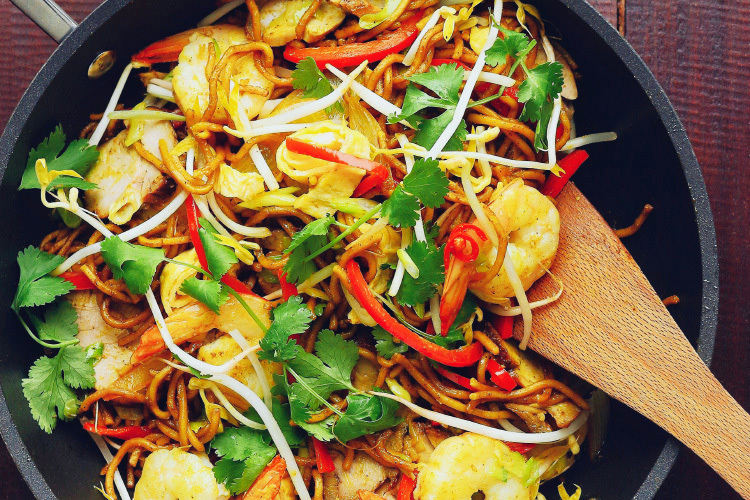 An easy noodle dish packing loads of great flavour. Singapore noodles aren’t from Singapore. They’re from Hong Kong, very much a fixture on the menus of Cantonese restaurants. Curry powder isn’t from India, either – it’s an entirely British concoction. It’s all very imperialist. Regardless of their twisted history, noodles stir-fried with curry powder make for fabulous eating. You can use any noodles you like – fresh, wok-ready or dry – as long as you prepare them according to packet directions (if necessary), rinse them under cold running water and leave them to drain. What’s important is that they’re quite dry before you fry, so give them a good 20 minutes, if not 30, in a colander before you start the serious action of this recipe. Thin rice vermicelli are a popular choice, although I prefer something slightly chewier, like a fine hokkien noodle. Anyway, the choice is yours. This can also be a terrifically useful way to clear out your crisper drawer, so add in or sub any other vegetables you have or like. Prep the noodles as required (see note above). Break the egg into a small bowl, whisk together with a fork and set aside. Get your vegetables ready to go: cut the onion into 8 segments and thinly slice the chilli, deseeded if you want less heat, capsicum and spring onions. Heat 1 tablespoon oil over medium-high heat in a wok or large, non-stick frying pan. Add the beaten egg and swirl it around to make a thin omelette, cooking until just set. Remove from the pan, roll and slice. Add 2 tablespoons of oil to the pan and stir-fry the onion, chilli and capsicum until the onion is soft. Transfer to a roomy bowl. Measure the curry powder and soy sauce into the pan. Add the noodles, tossing until well coated and warmed through. Transfer them to your big bowl. Heat the final tablespoon of oil and cook the prawns for a minute on both sides. Stir in the spring onion, then return the vegetables and noodles to the pan, tossing everything together. Serve straight away with a generous sprinkling of fresh bean sprouts and coriander leaves.